The Melo 3 Tank is a convenient clearomizer that fits on many 510 threaded mods and has an all stainless steel build for a universally appealing appearance. The Melo 3 Tank has an e liquid capacity of 4mls and has a diameter of 22mm for an all-day vape of less liquid fills and messes. Plus when it is time to refill your tank, you simply need to unscrew the top cap to have access to its liquid chamber. Towards the bottom of the tank is an “invisible” airflow control that allows the user to twist and turn it to adjust how much airflow the tank receives. If the user wants resistance while they inhale they simply need to twist it closed or if they want an easy and breezy vape, they can leave it all the way open for maximum clouds! All pieces of the Melo 3 Tank can become detached for a more favorable ease with cleaning and maintenance. Keeping your tank clean helps keep e liquid fresh and the taste as pure as possible. 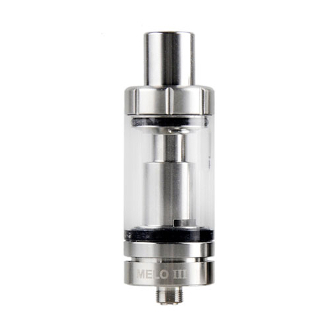 On top of the Melo 3 Tank is a heat insulated metal mouthpiece. The metal mouth piece helps keep your vape cool and avoids accidental to warm vaping.